Unique experience with its unusual but very comfortable tented rooms on stilts looking out over a gorgeous plain with a busy waterhole! The camp focuses on the essence of safari experience offering relaxed hospitality rather than luxury accommodation – as they say this is not about “spas and heated towel rails”! nThambo is a small authentic and uniquely styled camp in one of the least commercial parts of the greater Kruger area – the tented “tree houses” really gives you the feeling of being in the bush, especially with the tented walls rolled up when they become wonderfully airy! Great to be able to lounge on your bed or on the lodge’s pool deck looking out on a gorgeous grassy plain watching animals coming through to drink at the waterhole! As you would expect with it being Africa on Foot's sister camp, there are excellent walking guides who can take you on optional bush walks! If you’re looking for cutting edge style and luxury features then look elsewhere, nThambo isn’t going to be for you! 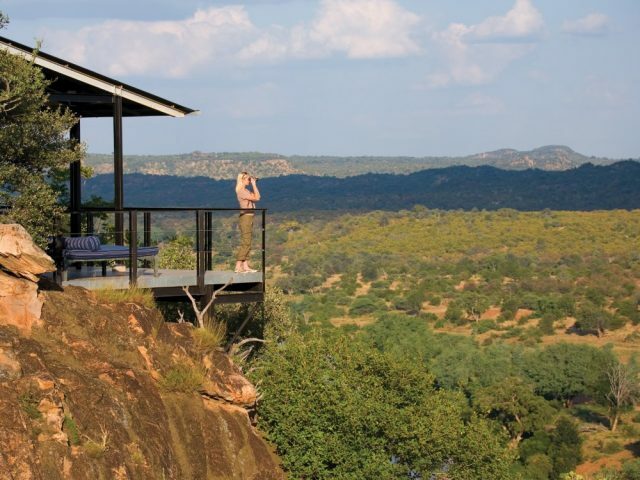 nThambo Tree Camp is a small intimate tented camp located in Klaserie Reserve which forms part of the Greater Kruger area sharing unfenced borders with the Kruger, Timbavati and Balule reserves. It covers some 60 000 hectares on either side of the Klaserie River and with no fences between the different reserves, wildlife can roam freely resulting in excellent Big Five game viewing including, at certain times, huge herds of buffalo and breeding herds of elephants. nThambo Tree Camp is the more conventional and more luxurious sister camp Africa on Foot (which specialises in walking safaris) but shares the same ethos of quality guiding in a pristine wildlife environment. 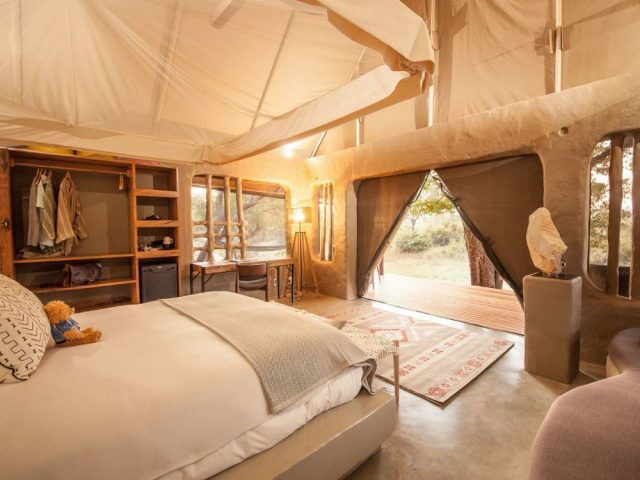 The lodge is quite unique amongst the hundreds of game lodges in the country in comprising of 5 unusual “tree houses” built on stilts above a gorgeous grassy plain and active waterhole and animals are free to wander through the camp. The rooms are built from thatch and wood which allows them to blend into their surroundings beautifully and they’re solar-powered to minimise their environmental footprint too. 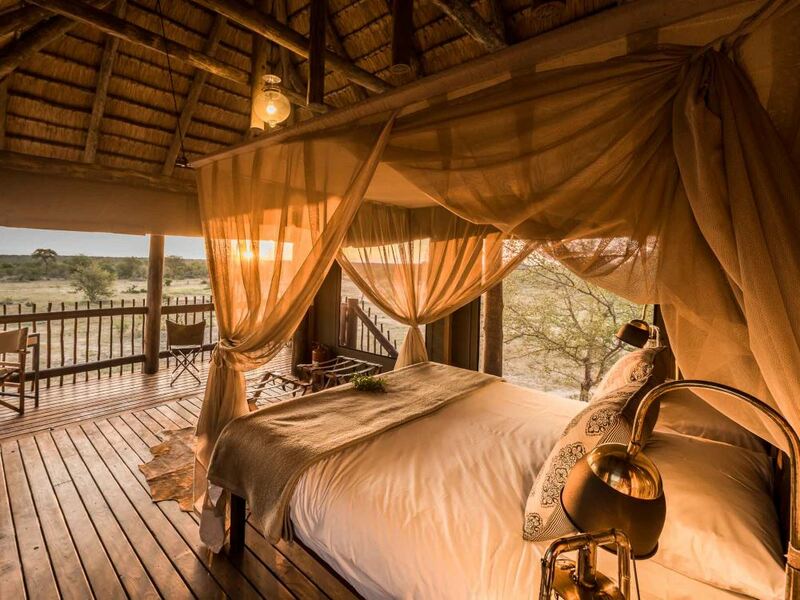 The tree houses boast wooden flooring and decking, with the walls being canvas tented sides under a thatched roof, completing one of the most unique safari accommodation options in the Kruger. The design of these tree house-style tents are a strong favourite amongst many as this rustic design seems to enhance your experience with wildlife and almost gives the illusion of living in the bush - with the tent walls up they're really wonderfully airy! All the tree houses are reasonably spaced out from each other ensuring you the utmost privacy and exclusivity – and with just 10 guests in camp even when it’s full nThambo is a wonderfully intimate experience! Each suite has the option of being made up with a double bed (for happy couples), or as a twin share (for friends or family travelling together). The chalets also boast en-suite bathrooms, rack wardrobes with coat-hanger space and shelves for clothing as well as a writing desk for you to document all your wildlife adventures! nThambo is a remarkably eco-friendly camp and they have been extremely conscious of reducing their carbon footprint with solar- powered fans and lighting also provided via solar power! But don't worry, there is one plug point in each tree house that is available for you to charge your camera and phone batteries. You can also enjoy a cold one on your private veranda which overlooks the plain and the small but much-visited waterhole in front of the camp – what we also love are the beautiful views of the Drakensberg mountain range in the distance! 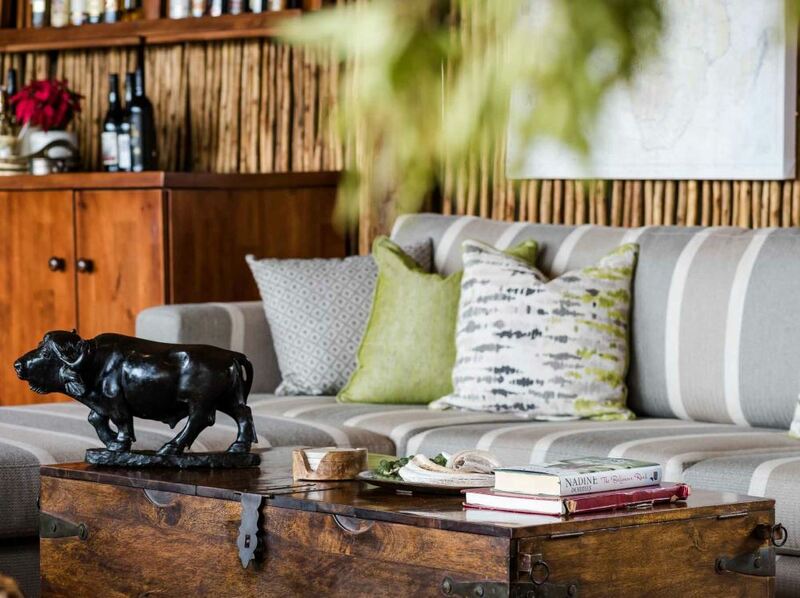 The camp's main area houses a comfortable lounge area under thatch and is lit with romantic lanterns – setting the perfect atmosphere for you and your better half. The dining room has a large table where part of the safari tradition is that everyone dines together - enjoying each other's company and getting the chance to meet some new friends from all over South Africa and afar. There's also a traditional boma that captures the true bush camp safari experience - perfect for warming you up with your coffee or for enjoying evening drinks where you can share your safari stories and game sightings with others around a roaring camp fire! Thrilling twice daily game drives are led by professional game rangers and experienced trackers in an area rich in wildlife – the reserve is home to the Big Five as well as hyena, hippo, giraffe, zebra plus a whole host of other classic African animals! The game drives are conducted in open 4x4 game vehicles and have no roof - so you get 360 degree views, perfect for wonderful photographic and video opportunities! Here you don't have to worry about missing special sightings of the Big Five – as your ranger will take you off road and ensure that you're up close and personal to these magnificent creatures! Guided nature walks and night drives are also on offer where you can experience the best and most diverse game viewing opportunities – nThambo truly offers you a full spectrum of safari activities! At this Tree Camp you can experience a true Kruger safari in an eco-friendly camp which is light on the environment and provides a truly personal Big Five safari experience! nThambo Tree Camp is a popular and affordable choice for the more adventurous looking for an authentic, rustic African bush experience - and not necessarily luxury and modern conveniences. nThambo's greatest asset is its informative, friendly and warm staff, who will ensure that you have an unforgettable game-filled holiday! 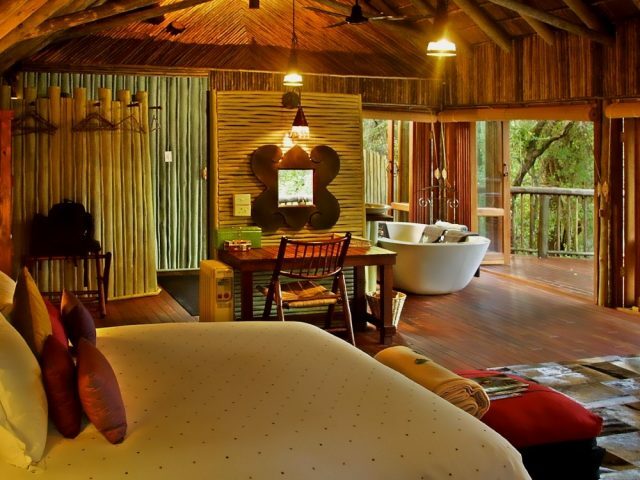 Eight stunning treehouses perched on wooden stilts in the forest canopy, Jaci's Tree Lodge is a wonderfully unique and very romantic alternative! Garonga is perhaps THE most romantic lodge we’ve come across with stunning tented rooms – you must try the gorgeous open-air bush bath experience!